Alibaba is an online marketplace that connects suppliers and manufacturers to businesses around the world. The Alibaba website originated in China so majority of the suppliers and manufacturers active on their marketplace are from China, however there are suppliers and manufacturers from other parts of the world. Alibaba is where businesses go to source manufactured products, both cheaply and in bulk, that they can resell or private label for their own businesses. 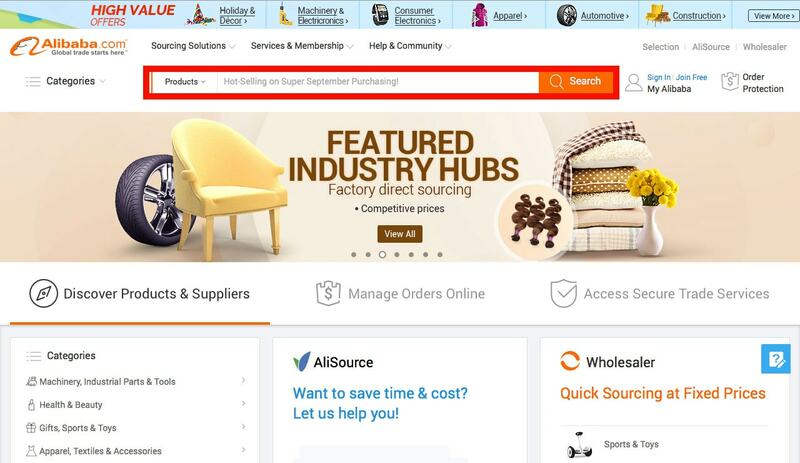 One of the best qualities of using the Alibaba website is that anyone, with or without their own business, can browse through their database of suppliers, manufacturers and products. Since it was founded in 1999, Alibaba has served as a valuable way for businesses, suppliers and manufacturers from all over the world to work with one another despite any geographical, language or cultural barriers that may exist. Although there have been many successful partnerships created through Alibaba’s marketplace, there have also been plenty of scams that are still under operation even to this day. The information of scams and how to prevent them will be discussed in this article, not to deter you from using Alibaba’s website, but to inform you of what risks are involved so you can properly recognize them and safeguard yourself. Use this guide as a resource to help navigate your Alibaba experience, and feel free to jump to the sections of this article that are the most relevant to where you are in your process. If you’re new to Alibaba’s website it can be overwhelming to use at first. Here are some of the main areas to become accustomed to so you can navigate through the marketplace with ease. 1. This is the area of Alibaba where you can sign up or login to the website. You’ll also be able to manage any orders you place, your buyer requests, your account, your favourites and other aspects of the website you need direct access to. 2. The search bar. This is where you can search for any products, suppliers or quotes on products that you’re interested in. 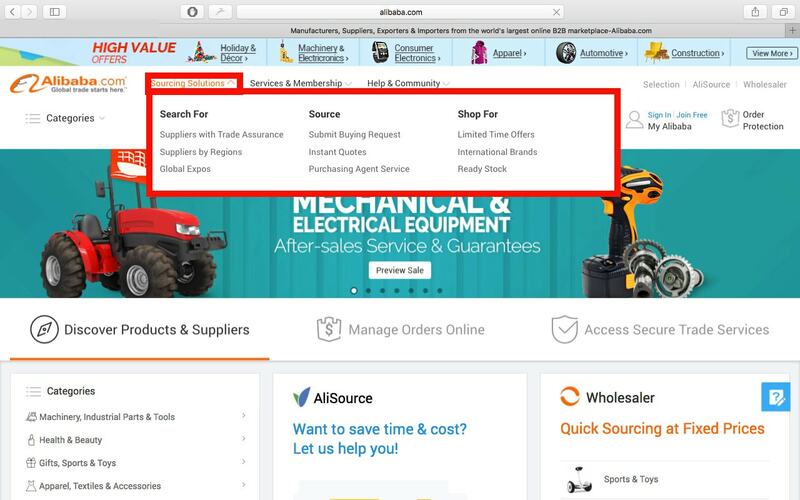 Note that the drop-down box on the left hand side of the search bar is where you can select the “Products”, “Suppliers” or “Quotes” categories to help you refine your search. 3. This is how the search results appear when headphones are searched with the “Products” category selected. 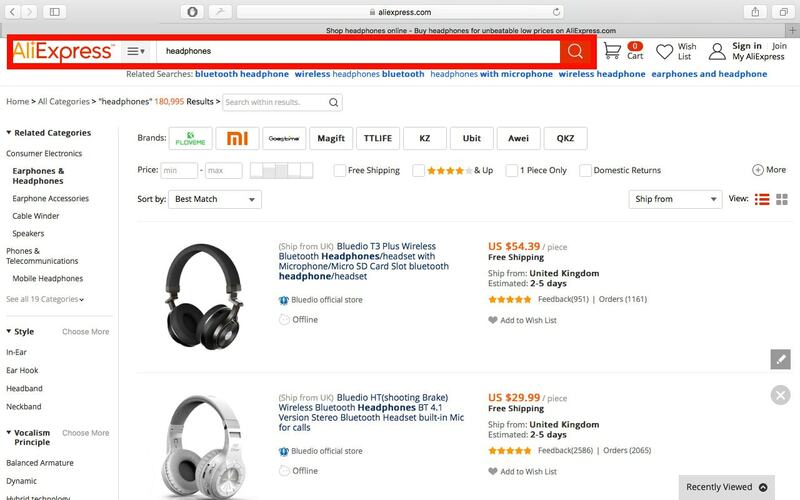 The search results you’re given are products on Alibaba that relate to your search term. 4. 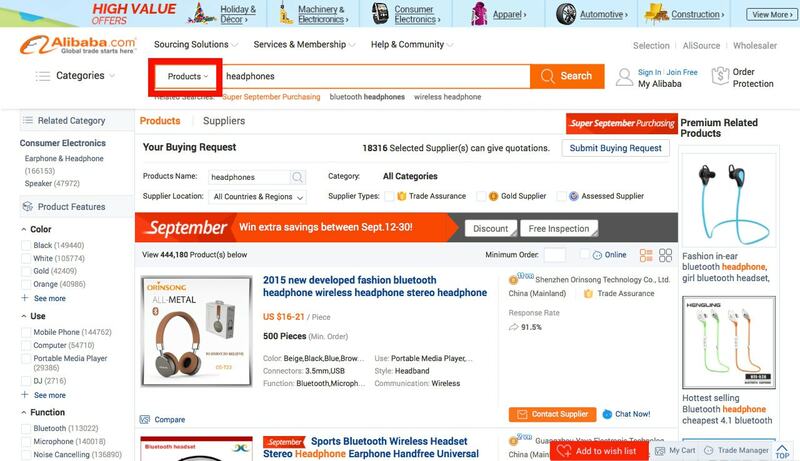 This is how the search results appear when headphones are searched with the “Suppliers” category selected. 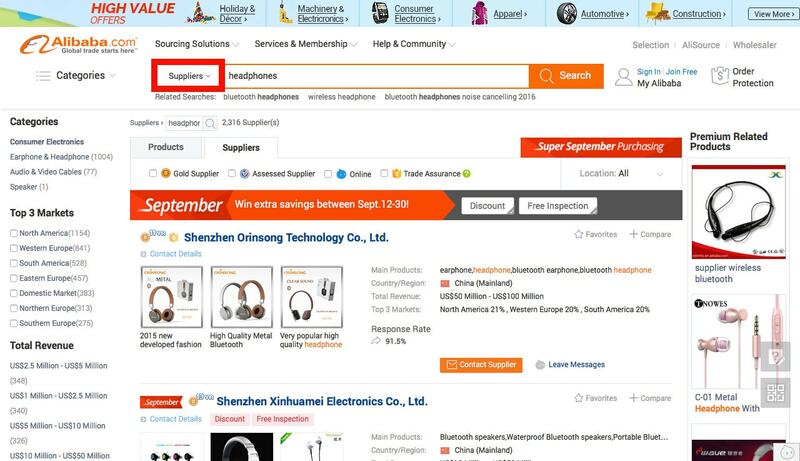 The search results you’re given are suppliers that exist on Alibaba who produce the item that you’ve searched. 5. This is how the search results appear when headphones are searched with the “Quotes” category selected. The search results you’re given are for suppliers who can give instant quotes for the product you search. 6. The “Sourcing Solutions” drop-down menu gives you plenty of options you can use to refine your search. Search suppliers by region, look at global expos, submit a buying request, shop for ready-made stock, etc, this menu helps you find what you might be looking for in a more efficient way. 7. 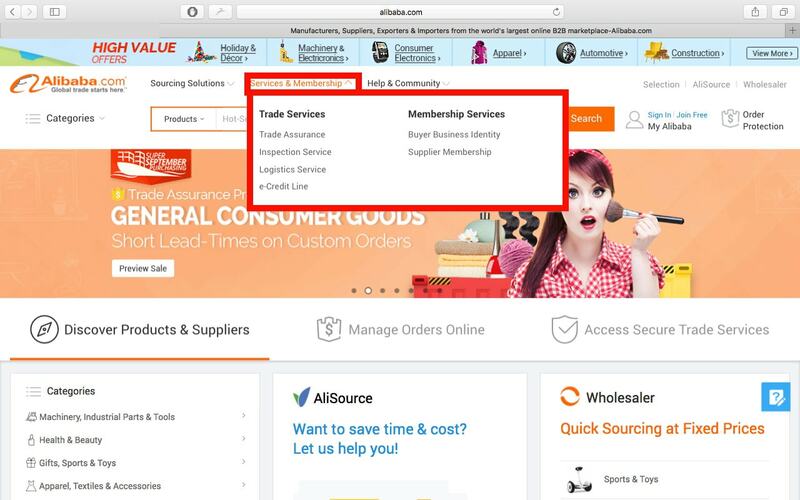 The “Services & Memberships” drop-down menu gives you information about what kind of services and memberships Alibaba offers. 8. 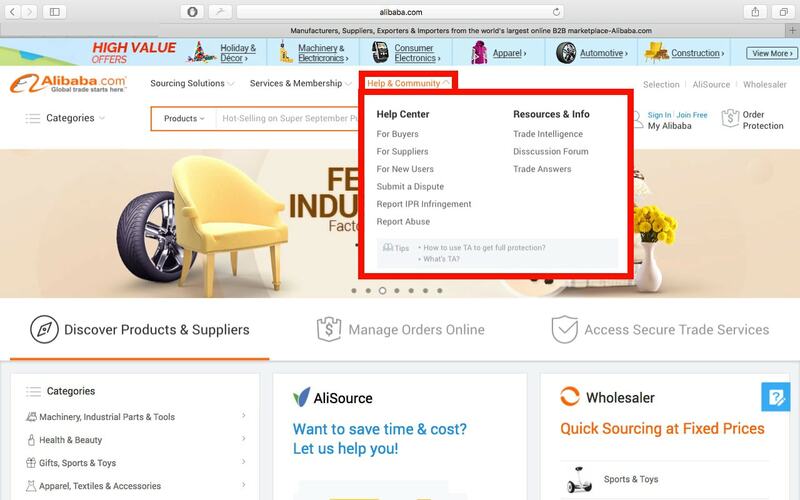 The “Help & Community” drop-down menu is Alibaba’s go-to place for any help you might need. If you’re new to Alibaba, check out the “For New Users” or “For Buyers” option, also check out the “Discussion Forum” located under the “Resources & Info” header to read about and ask any questions you may have. 9. 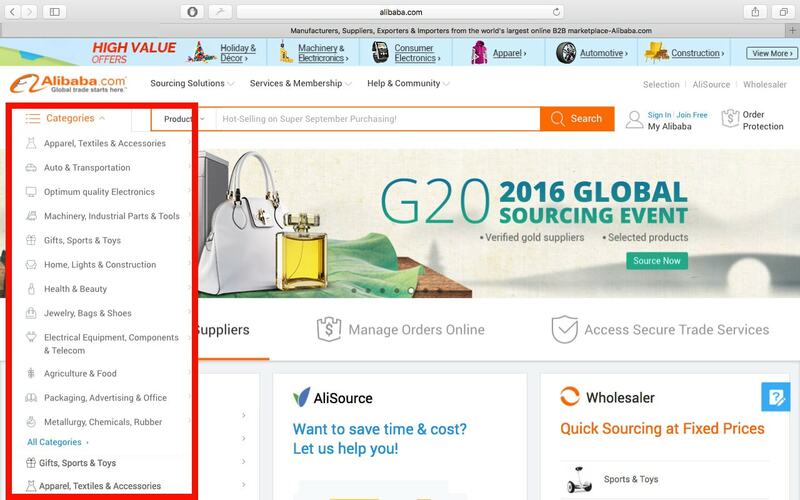 The Categories menu helps you refine your search through Alibaba based on what category you’re interested in. This is a great place to look if you have an idea of the niche market you want to service but don’t actually have a specific product in mind as this can show you what products actually exist in any given market. 10. 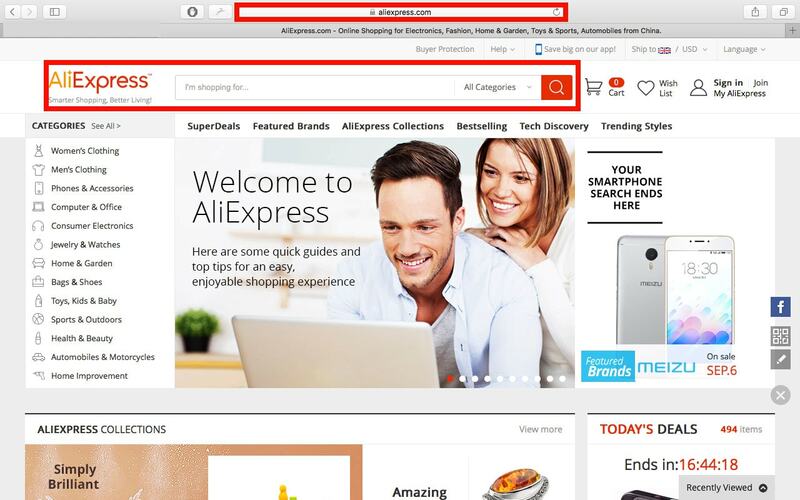 Alibaba also has a sister website called AliExpress. This marketplace is targeted towards the consumer market, rather than the business market, however in recent years many ecommerce businesses have started sourcing their products from AliExpress rather than Alibaba so they can purchase in smaller quantities rather than in bulk. Conveniently, most products on AliExpress also ship for free to most places in the world, but the shipping time still remains lengthy (up to 30 days). 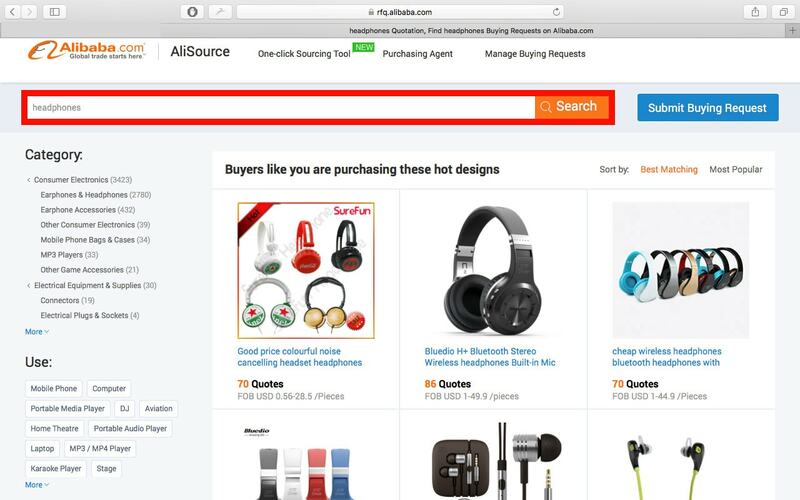 Use AliExpress’ search bar to shop for whatever products you’re interested in purchasing. 11. These are the search results for headphones on AliExpress. Compare these search results to the same search we placed earlier on Alibaba. Note that the products here on AliExpress can be purchased singly (instead of in bulk) and can be purchased outright (with no modification or negotiation needed between you and the supplier). There are two different Alibaba marketplaces that cater to different types of business and one may be a better fit for your business than the other. Alibaba: As mentioned above, Alibaba is a marketplace that connects suppliers and manufacturers with businesses and is ideal for business owners who want to place large quantity orders at the cheapest price per unit they can get. Businesses work directly with manufacturers on Alibaba to create and their own products, or to find manufacturers who specialize in creating certain types of products and then private labeling them for their own brand. Use Alibaba if you want to work directly with a manufacturer, create/private label your own product, or to place large quantity orders at the cheapest price. AliExpress: Operates at the consumer level and enables buyers to purchase low quantity amounts (rather than in bulk) at factory prices. Buying in bulk on AliExpress isn’t typically an efficient way to buy product as stock for a business because the prices are higher than they would be on Alibaba, however, for new businesses owners who need small MOQs, AliExpress may be the best option. If you aren’t familiar with what drop shipping is, check out our post Drop Shipping 101: What is Drop Shipping? Drop Shipping is offered through Alibaba, just search “dropshipper” and your product name and the dropshippers that offer that product on Alibaba will be displayed. It’s worth noting, however, that depending on your target market and where your target market is located geographically, drop shipping through Alibaba isn’t always the best option. Try searching for drop shippers in your area or check out our list of drop shippers here. 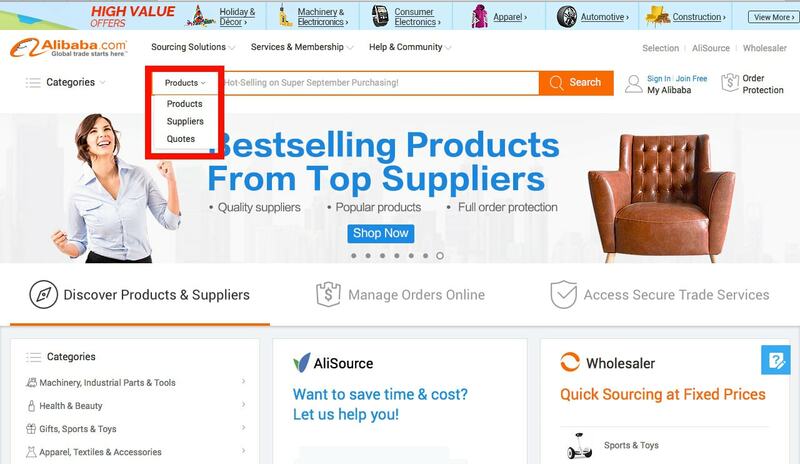 AliExpress also offers drop shipping options, however, there may be better options for you to source your products, such as this list of 20 AliExpress Alternatives to Source Your Drop Shipping Products From. One of the main reasons sourcing products from Alibaba is such an attractive option, especially for westernized countries like USA and Canada, is because the products are sold at an extremely affordable price point, meaning businesses are able to increase their profit margin more than if they were to source products locally. With that single advantage, there are disadvantages that come along with it, but it’s worth evaluating all the pros and cons so you can decide if sourcing from Alibaba is the right choice for your business. There’s a larger quantity of suppliers to choose from on Alibaba for any given product, rather than if you were to search for manufacturers of that product in your area. Depending on the product, there may not be any manufacturers in your local area and sourcing from overseas is your only option. There are lower manufacturing costs, usually, because the general labor costs are much lower than they are in countries like the US and Canada. Consumers know that labor and manufacturing standards are lower in places like China, so producing products there comes with connotations of it being lower quality. Because of low labor and manufacturing standards, there are possibilities that workers are not compensated fairly for what they do or that they work in unethical environments. There may possibly be a language and/or cultural barrier between you and the overseas supplier, making communication difficult or confusing. Shipping takes longer, can be costly, confusing, and will have to be cleared through customs. Little to no intellectual property protection due to factories copying one another and/or selling manufacturing instructions. Difficult to visit the factory yourself which can prove inconvenient if you’re wanting to verify the legitimacy of the manufacturer or supplier. Hiring companies in the area of your factory to verify its legitimacy can be costly and sometimes useless because those companies may have ties to the factory and may not provide truthful reports. Knowing who you’re talking to is especially important when you’re searching for a supplier or manufacturer to work with on Alibaba. There are three different representatives you’ll find on Alibaba, and their jobs are entirely different from one another and can affect your experience. Manufacturers: Manufacturers make products. Simple as that. Manufacturers operate factories that have the materials, equipment and/or staff to make physical products. Distributors: Distributors buy products from manufacturers and then sell them. They don’t actually make the products themselves, but they have the resources and the contacts to sell the products to businesses that will buy them. Trading Companies: Trading companies buy multiple kinds of products from different factories and sell them. Again, they don’t manufacture any of the products themselves, but they source them from multiple factories and sell them to other businesses. Why is this important for you? Your experience on Alibaba may depend on whether you’re sourcing your products from a manufacturer, a distributor or a trading company. Working directly with a manufacturer is the best way to ensure you’ll be able to make the most profit because you’ll cut out all the middlemen (the distributors or trading companies) who also make a profit from you purchasing products from them. The disadvantage with working with a manufacturer, however, is that they often don’t employ the resources to hire English speaking salespeople, so working with a language barrier between you and a manufacturer can create many problems. This isn’t true in every case, there are manufacturers who have the resources to provide English speaking services, but this disadvantage does exist. Most of the time the suppliers you’ll find on Alibaba will be Trading Companies because they’re in the business of selling the products they acquire from manufacturers, so they have more of the resources to employ English speaking representatives. However, because Trading Companies don’t make the products themselves, they can often create more confusion if you ask specific questions or if you want to modify the product in any way. It’s best to work directly with manufacturers, if it makes sense for your business, because manufacturers know the entire process of making their product, they know how it can be modified, and purchasing it directly from the manufacturer will ensure you can sell to your customers at a lower cost while still maintaining a decent profit margin. Beware that on Alibaba, it isn’t required for suppliers to identify themselves as manufacturers, distributors or trading companies, and it’s easy for any of them to just respond “yes” if you ask them if they’re a manufacturer, so don’t be too trusting if that’s the reply you get. One of the most surefire ways to know between the three is to look at the product selection they offer. If you find a supplier who offers keyboards as well as headphones they are most likely going to be a trading company because a manufacturer more often than not offers one product only and specializes in creating that product. Alibaba has been notoriously recognized for scam transactions that have taken place over the years and has developed somewhat of a reputation for not being the safest marketplace to purchase from. This isn’t entirely a fair way to evaluate Alibaba’s services, however, as plenty of non-spammy suppliers represent themselves on Alibaba, and plenty of buyers throughout the years have- and do- purchase quality products through Alibaba. That being said, scams still to occur and it’s your responsibility to take every necessary precaution so you can prevent yourself from getting scammed. The first and best tip is to always use your own common sense. No matter what, always trust your gut feeling and if a deal seems too good to be true, it probably is. Determine the legitimacy of your supplier. It’s possible for someone to create a supplier account, put on a convincing show for buyers and disappear once they have your money, so determining whether all their contact information is correct is a good first step in determining their legitimacy. Make sure their email, telephone number and website all check out, make sure they have a legitimate address (not a P.O. Box, as anyone can get a P.O. Box), and check their website registration to see who it was registered by and if there’s a phone number. Search them on Domain Tools. Also, check if they’re a member of any trade associations or organizations as that can give you more insight into their company. Look for Alibaba Gold Suppliers. Gold Suppliers will have the Gold Supplier icon on their page and it lets you know that they have been inspected and given a seal of approval by Alibaba itself, plus they’ve passed authentication and verification checks which are typically done by third party agencies. Gold Supplier icons will also let you know for how many years this supplier has been active on Alibaba, which is a good indication of their trustworthiness. Note that using Gold Suppliers isn’t totally a failsafe way to ensure you’ll have a trustworthy supplier, but it’s a good filter to start off with. There is still a possibility of scams with Gold Suppliers, and non-Gold Suppliers can still be trustworthy, so do your own due diligence. Search Alibaba forums, reviews, Google or Scam.com for complaints or testimonials about suppliers on Alibaba. This will give you a good insight about the supplier that you may not be able to find elsewhere. Also, check out the service ExamineChina as they verify Chinese companies and can provide you with a report on any supplier you’re interested in working with. Ask suppliers for references. Trustworthy suppliers will have no problem providing you with references, but make sure to determine the legitimacy of those references as well because they could be affiliated with the supplier in some way. Once you have reputable referencers, ask them if they’ve had issues with the supplier, what they paid for the material and for the product, how long they’ve been working with the supplier, ask to see their product to observe the quality and ask if they’d recommend working with the supplier. If you’re working with a supplier that produces branded products, like Ray-Ban sunglasses or Disney toys, for example, make sure they have a legitimate license to sell their branded products so you don’t run into any legal ramifications down the road if they didn’t have a licence (yes, you will be responsible). Go visit the factory, if you can, and if you can’t, pretend you’re coming to visit. Reputable suppliers will welcome your visit, and if any suppliers advise against a visit consider that a red flag. Consider sending a third party inspection agency to visit the factory on your behalf and report back to you. Be aware that while these agencies may not have a direct affiliation with any manufacturers and may seem safe, they may still accept bribes from suppliers and not report the whole truth back to you. Really do your research if hiring a third party inspection service, or else, visit the factory yourself. Observe what methods of payment they accept. If they work with Alibaba’s Secure Payment System or PayPal, that’s a good sign because those are the two safest ways to pay on Alibaba, as they offer services where you can pay in installments (a down payment first and then the rest of the payment once you’ve received your order to your satisfaction) or they offer dispute resolution services if the supplier did not follow through with their responsibilities. Be wary of suppliers who only accept Western Union as a payment method as scams have been known to happen through that payment method. Document everything. Save emails, record telephone calls, film Skype sessions, keep faxes and papers, archive instant message chats, take photos of sample products, keep absolutely every piece of communication you have between you and any suppliers so it can be used as proof in the event it’s ever needed. This is one of the simplest safeguarding methods you can use that can really save you in the event of a potential scam. Those are ten great tips on how to protect yourself from potential scams, but always remember to do your own due diligence, do more rather than less, always trust your instinct and use common sense. Doing more research, in the beginning, to find a trustworthy supplier, although it may be tedious, can save you from massive headaches, inconveniences and not to mention a loss of money, in the long run. This starts with knowing what product you want to sell and every detail that goes along with that. If you aren’t sure what product you actually want to sell, if it’s a good product idea or not, or if you need help finding the right product to sell online, check out the previous articles we’ve written on this subject. Once you’ve figured out what product you want to sell online, then you can move onto the next step. Ask yourself first if your product already exists or if it needs to be created. This will impact who you work with on Alibaba and how you need to present your idea to them. If your product already exists just find a manufacturer who specializes in making that item. If you’ve invented a new product, you’ll have to find a manufacturer who can make it for you, give them a prototype to work from and develop some samples. Regardless if your product already exists or if it needs to be created, you must know every detail about how you want your product to look and be constructed, down to the materials, the hardware, any numbers or sizes, etc. This will take some research. One of the biggest parts of your research will be sitting down with Alibaba and perusing through the marketplace to see what you can find. Search by product, by supplier, place a buying request if you need help finding the perfect manufacturer, but just get a lay of the land and get a glimpse into what you have to work with. No need to make any hard decisions right away, just survey the scene. Be aware of your options and find the right one for you. Above we talked about Alibaba’s sister website, AliExpress. Get an understanding of what AliExpress has to offer compared to what Alibaba has to offer, and which of their MOQs and price points are better options for the product you want to sell. This will help you make a more informed decision based on what’s out there for both marketplaces..
Once you’ve researched your product and your method of production enough to know what exactly it is that you require, continue searching for suppliers that fit your needs exactly. Before you start even looking at suppliers it’s important to know how much money you have to work with. This will determine the quality level of the products you’ll be able to buy, the quantity of the products, and the suppliers you’ll be able to work with. Keep in mind that as well as spending money on purchasing products, you’ll also have to set parts of your budget aside for ordering samples and shipping products, so don’t underestimate. Being a marketplace full of suppliers, there’s sure no shortage of them on Alibaba, it can make the process overwhelming. Not only that but with the threat of scams, which suppliers can you trust? As we’ve mentioned above, nothing is foolproof when it comes to Alibaba, but there are a few tips you can use to distinguish good quality suppliers from poor quality suppliers. Always validate their information first. Email addresses, telephone numbers and their website, make sure they are who they say they are and that you will be able to reach them through their contact info whenever you may need to. They should have a physical address listed, NOT a P.O. Box. Having a P.O. Box listed as an address is a huge red flag because anyone can get a P.O. Box without actually needing to have a physical storefront or legitimate factory. Google them. Easy as that. See what kind of information comes up about them and try to find out if they’re part of any supplier organizations or if you can find any reviews, complaints or testimonials. Check if they have Gold Supplier status on Alibaba, if they have any verified info or if they have had a Supplier Assessment or an Onsite Check done. This won’t always ensure that every supplier or manufacturer with these credentials is 100% reliable, however, it is a good place to start. Always bear in mind that you’ll have to research past these symbols, don’t take them for their face value, and other suppliers or manufacturers without these credentials can be quality too. When you contact the supplier they should respond to you quickly. In the long term, you’ll want to work with a supplier or manufacturer that’s available and can answer your emails within a reasonable amount of time, rather than working with a supplier who takes a month to get back to you and delays your work. See how they respond to being asked for references. A reputable supplier will be happy to provide references, but if a supplier resists giving references take that as a bad sign. Always make sure to determine the legitimacy of the references as well. Observe their payment details. You’ll want to work with suppliers who use Alibaba’s Secure Payment System or PayPal. Be wary of suppliers who only accept Western Union or wire transfers, as those payments can be difficult or impossible to reverse once they go through. Look for pictures of the factory, either on Alibaba or from Google searches. Of course, suppliers may not post photos of their whole factory or they could edit or stage the photo in some way, but it can at least give you some idea of the factory. There are a couple options you have for where you can actually communicate with suppliers. Firstly, right on Alibaba itself you can instant message with suppliers, secondly you can contact them directly through their contact form which is located at the bottom of their page, thirdly you can click the “Contact Supplier” button which will take you to a separate window so you can message the supplier there and finally, you can also communicate via Alibaba’s TradeManager instant messaging tool which is an easy way for you to manage all the conversations you’ll be having with all your potential suppliers. When contacting suppliers there is one singular important tip: be clear. As there may be a language or cultural barrier it is important that if you want your message to be understood you need to write clearly, above all else. Write clearly and concisely. This cannot be overstated. Don’t use slang words or phrases, as those don’t translate clearly into other languages. Try using full words instead of compound words (say “do not” instead of “don’t”, “cannot” instead of “can’t” or “they are” instead of “they’re”), again, because they will translate more clearly to your supplier’s language. Write at around a grade 5 reading level. This is not intended to impugn the intelligence or English comprehension level of the email recipient, however, it just ensures the point of your message will be received as clearly as possible. Instead of writing out numbers in words like one, two or three, use actual numbers like 1, 2 or 3. This helps avoid any mistranslations or miscommunications. Be polite and considerate that the business practices of your home country may not be the same in the country of your supplier’s. Use bullet points and numbered questions to communicate rather than paragraphs or long sentences. This helps your message to be read clearly. Don’t ask too many questions at one time. Start off with your top 3-5 questions at first and start from there. As you continue to correspond you can continue asking questions. The more questions you ask it’s more likely the fewer answers you’ll be given. Use images created on Photoshop or AutoCAD to depict exactly what you have in mind for your product if it’s a product you’ve created. Include specific dimensions, make sure the image is to scale and refrain from sending loose sketches that can be misinterpreted. Don’t assume anything. Keep asking questions, even if you feel like they’re dumb or repetitive questions, and state the obvious, because it might not actually be obvious. When sending messages to suppliers a great idea is to start off with a basic template email to send to all the suppliers you’re initially contacting. This will give you somewhere to start and you’ll be able to keep track of what you’ve asked each supplier rather than wondering who you have asked what to. Here are some important questions to ask suppliers, remember, you shouldn’t ask these all in the first email, but these are examples of questions you’ll eventually want to know the answer to. Ask what their Minimum Order Quantities are (MOQs). Ask what colors they offer their product in. Ask how they receive payments, what their preferred method of payment is and state what your preferred method of payment is. Ask what their price per unit (PPU) is so you’ll know exactly what the overall product production will cost you. The supplier might just be really busy. Although frustrating, this is a real reason to take into consideration. Especially when it comes to working with manufacturers, their main job is to actually manufacture products and manage their staff, equipment and their customer service might be on the back burner. Have patience and/or try following up a few times. If they really aren’t responding or take a long time between messages to respond, maybe move on if that isn’t going to work for you and your business. If you need a manufacturer who is available often and can respond quickly, don’t try to work with a manufacturer who isn’t giving you that kind of attention because it won’t work out long term. The supplier might have gone out of business. It happens, and sometimes it happens quickly. Your only choice, if this is the case, is to move on. A supplier might not respond because your MOQ (Minimum Order Quantity) is too small. 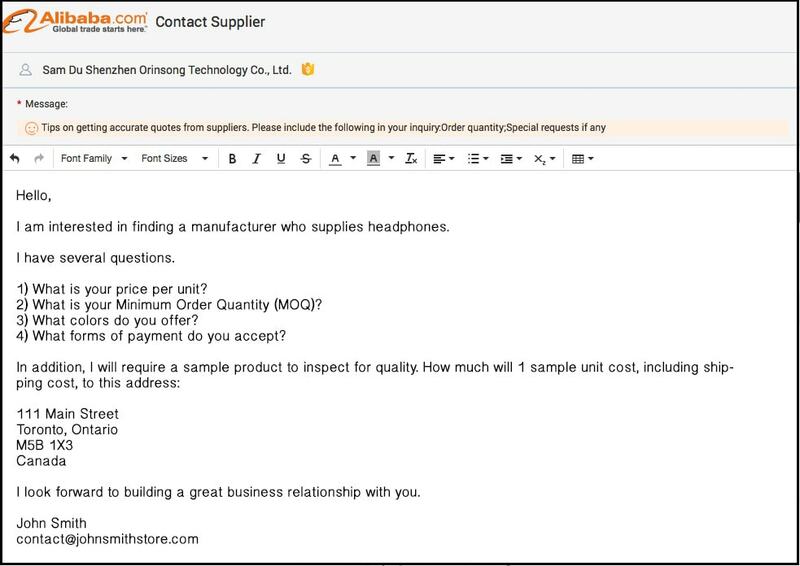 Suppliers have their MOQs in place for a reason and while they can be negotiable, within reason, proposing too small of an MOQ right off the bat can be an easy way for busy suppliers to filter through contact emails quickly. Try finding a supplier whose MOQ you can meet or try to come to a negotiation with the supplier, like ordering the MOQ amount of products in installments. The person who answers customer emails is on vacation. Yes, it happens. In this case be patient or start looking for other suppliers in the meantime. It takes time and effort contacting suppliers, but this is one of the most important parts of the Alibaba process. This is your time to filter out the poor quality suppliers and find the right one for your business, so come into this stage knowing what you want from a supplier and not settling until you find one that’s right to work with long term. When you’re looking to work with a supplier or manufacturer, there are a few responsibilities your future supplier must be comfortable with meeting in order for you to have a mutually positive working relationship. That being said, suppliers or manufacturers are not entitled to meet these responsibilities unless these roles are established upfront, so don’t assume anything and make sure you discuss these responsibilities with your future supplier. Your supplier is responsible for making sure your products are packed correctly when being shipped to you and meets all shipping standards. As you are not there to oversee the shipping process, it’s up to the supplier or manufacturer to make sure they’re fulfilling that role responsibly. Depending on which shipping method you choose (read about the options in the shipping section of this article) they are responsible for getting the products to you in one piece and they are responsible for the products until they reach you. They are responsible for handling the appropriate paperwork so your items can legally leave their country. Since they are the one shipping the products out, it’s up to them to make sure the products are leaving with the appropriate documentation, and since you’re responsible for bringing the products into your own country, it’s up to you to have the correct documentation for the products to enter the country. Just as with everything on Alibaba, things may not always be as they seem, and caution should always be exercised. When it comes to finding suppliers, the “verified information” is often misleading and irrelevant and is used by Alibaba to earn additional money from suppliers. If suppliers or manufacturers have any verified information or have “Supplier Assessment” or “Onsite Check” icons, you still have to conduct your own due diligence. FetchChina: UK Owned & China Based Sourcing Company That Helps Small & Medium Sized Businesses Prevent Getting Scammed. ExamineChina: Verifies Chinese suppliers and creates a detailed report based on information from numerous sources such as banks, customs, social security offices and more. Be aware that product photos on Alibaba are often shared between suppliers and manufacturers, so it’s impossible to tell the actual quality of a listed product just by looking at the accompanying photo. Not only are product photos shared, but successful products are copied between many different factories, so if you see the same product being advertised at different price ranges, it depends on which factory it’s coming from and why. First of all, the product could have been listed at a time when the material to create the product was higher, and it has since dropped so that product will be listed at a higher price. Secondly, the same product listed at a higher price may be made of higher quality material than that advertised at a lower price. Thirdly, if the product is being advertised by a trading company instead of a manufacturer, the price will be higher because trading companies mark up the price so they make a profit. Information such as the supply availability, amount of staff and the sales turnover is almost always overstated to make the supplier or manufacturer seem more in demand. Lastly, factories that are more in demand, meaning that these are large factories that have the ability to produce a large quantity of product, will almost always have higher Minimum Order Quantity (MOQ) specifications. If you don’t actually need a large number of items, don’t work with the largest factories. Smaller factories are a great place to start because their MOQs will be lower, they’ll be more flexible with your requirements, they’ll be hungry for your business and more willing to adapt to your needs. Once you’ve been corresponding with some suppliers and you’re starting to get an idea of their prices, MOQs and payment terms, it’s time to begin negotiating. What is negotiable? MOQs are almost always negotiable, within reason. Bear in mind that it costs the manufacturer to use materials and equipment every time they make a run of products, and depending on the size of their operation it might not be feasible for them to create anything lower than a certain amount of products, so always negotiate within reason. If you really need a small product order, try sourcing from AliExpress instead. Other than that it’s worth negotiating on other aspects of the production process like materials, hardware, quality or colors – again, within reason – if it will provide immense benefit to your business. It’s worth asking, but don’t expect the manufacturer to provide it for you. Note that if you try to bargain down the price of the products, that may force the supplier to lower the quality of them so they can achieve the low price and still make a profit. If you don’t want to lose out on quality, come to terms with the fact that it might cost you a little extra. Research everything about your product so suppliers can’t take advantage of your lack of industry knowledge. Research typical materials costs, production times, shipping costs, options and times so you have an industry standard to measure your supplier up against. If you think they’re asking unfair prices or quantities, mention it to them in a professional manner. Be specific and keep things simple. Be clear with what you’re asking them and don’t assume anything. Reach out to a few suppliers and observe how different each supplier’s MOQs and prices are. If you’re communicating with enough suppliers you’ll be able to get a general average and be able to identify any outliers who may be trying to take advantage of you for quality, quantity, or price. Make sure you’re working directly with manufacturers, not distributors or trading companies, so you can get the lowest possible cost. Distributors and trading companies mark up the products they source from manufacturers so they can make a profit. Be patient but take deadlines into account. If you need to have a product out within the next year and you and your suppliers can’t get past the negotiation phase, adjust your approach or move on. Don’t take advantage of your supplier. They need to make money too and their materials, equipment and overhead costs aren’t free, so don’t try to milk them for all it’s worth. Be reasonable as you don’t want to start off a business relationship with your supplier feeling undervalued or resentful. If suppliers aren’t taking you seriously, invest some time, resources or money to show that you’re serious. If suppliers think you’re just tire-kicking they won’t waste their time and resources on you because they see tire-kickers all the time. Prove to them that you actually plan on working with them. Re-state your agreement with your supplier to confirm that everything you’ve listed is the compromise you’ve reached. Don’t let suppliers try to re-negotiate once you’ve come to an agreement. Document everything in case you need proof of the agreement later. If you feel like what the supplier is offering you isn’t fair, walk away. It isn’t unheard of to receive a follow-up email a few days later offering a better price. Always order samples. If you think you don’t need to order a sample, order a sample. Order a few samples. Order samples from different suppliers. Start up a different Alibaba account, contact the same supplier and order a sample to see if it arrives the same. Don’t believe that suppliers can create your product until you see a sample of it. Product photos on Alibaba are almost irrelevant because they get stolen and shared, so it’s entirely possible that the sample you’re ordering will look completely different from the product photo. Ordering samples from several suppliers will help you narrow down which supplier you’ll want to work with. Check for quality, consistency, materials, and the overall look and feel of the product. Bear in mind that just because you like the first sample you receive doesn’t always indicate every sample, or the product run, will turn out exactly the same. Samples may differ from one another or from the production run because they’ll be from different batches. Other times suppliers may send you a really nice sample and then lower the quality for the production run. Moral of the story: order sample but don’t always trust them. Keep in mind that you will likely have to pay for samples. Suppliers put this in place to weed out any “tire-kickers” who will order one sample and never actually follow through ordering products after that. Samples do cost money to make, so don’t expect them to be free. However, some suppliers graciously offer free samples, so that’s a bonus if your supplier does. Other times you may have to just pay for the shipping, but many times you’ll be paying the full price. There’s a high possibility that your product won’t come out the way you want it the first time, so after every time you make adjustments make sure to get another sample. Never assume that the manufacturer sees your vision, even if they say they do. There’s no worse way to lose a ton of money than to assume the manufacturer created the product to your specifications and blindly pay for the product run only to be disappointed in the way the products turned out. Order samples. Price: Which supplier gives you the best bang for your buck without compromising quality? MOQs: Is there a supplier you’ve been able to negotiate the MOQ to your ideal sweet spot? Payment Terms: Is there a supplier whose payment terms are ideal for you? Will they accept payments in installments or can you pay half up front and half after you receive the finished product? Communication & Availability: Is there a supplier who responds to your emails in good time, notifies you if they have any questions, chat messages with you or Skypes? You want to do business with a supplier who is available when you need them and contacts you when they need your input to keep your relationship strong and your business able to move forward. If you’re wanting to sell a product that doesn’t already exist on the market you’re going to have to do a little searching on Alibaba to find the right manufacturer for you. If your product is based off a product that already exists with a modification or two, contact suppliers who already make that product and see if they can omit or add certain aspects of the product to make yours. If you aren’t sure which manufacturer you should choose to create your product, post a buying request on Alibaba. This way manufacturers can read your request and reach out to you if your product is something they are capable of creating. Once you’ve found a supplier who says they can make your product, you’ll first want to send them a sophisticated drawing, mockup, wireframe or prototype so they evaluate exactly what it is that you need. Make sure that everything is to the correct dimensions and don’t leave out any information as that can lead to confusion. Leave no room for error and be very specific about color, size, weight, dimensions and material so your manufacturer doesn’t have to assume anything. Let them know how many you plan on getting made, if you have a production method in mind, and any specific materials your product might require to be made. After you’ve sent the visual representation of your product to your manufacturer, make sure to get a few samples made. Each time you get a sample, evaluate it for quality and conduct a series of tests on it (like a drop test, or anything that applies to your type of product) to determine its durability and then send back revision notes to your supplier until you finally receive a sample that meets all your expectations. When the perfect sample has been created, place a small order with your manufacturer to determine how they handle the mass production of your product. Quality can decrease when production increases so make sure that batch measures up to your expectations. Also take note if there were any defective products in the order, if there were, ask your manufacturer how you can be compensated for defective goods. Sometimes it doesn’t make sense to ship back defective products to be fixed so manufacturers will add the number of defective products to your second order. If the small batch order pans out according to plan, order more as needed. If you weren’t satisfied, consult with your manufacturer. In the midst of negotiating, selecting a supplier, and placing your first order there are some aspects of the process you may not take into consideration. Where do you plan on storing your inventory? Are the products being forwarded to you or to your fulfillment warehouse? If they’re coming to you, can you store them in your house or do you need a separate space for them? What do you want your profit margins to be? The higher your profit margin either the lower the cost of the product from your supplier, the lower the quality, the higher you have to price your product or a mix of those three options. This can impact what kind of materials your supplier uses to make your product and even the shipping method your products will take to get to you (shipping by boat is cheaper but takes longer than it does to ship by air). Have you factored all the potential costs into your budget? If your supplier needs to make special molds to make your product, how does that fit into your budget? Are you shipping prototypes to and from your supplier? Did you only budget to order one sample? What if you need to order a few? Will that eat into your budget? Make sure you know all the costs you have already paid for and will pay for, and give yourself a little wiggle room too just in case you’re surprised by any additional costs. Research if there are any rules or regulations that might prevent your product from shipping by air or freight or that may stop it from being able to enter your country. Especially check the rules surrounding consumable, cosmetic or branded/trademarked products for your country before you start production on any of these items. Trademarks: Protect brand identities like names and logos. Copyrights: Protect works of art like writing, art, music, movies and photos. Patents: Protect ideas like inventions and innovations. Typically, trademarking, copyrighting or patenting is not usually worthwhile because it’s only effective in the country where you file it under, it’s costly, and when you’re just starting out you are just developing your brand so you don’t really have anything to protect. Plus, it’s the nature of Alibaba that product photos, plans, and information get stolen and shared if it’s successful, so don’t expect your supplier to stop other manufacturers from producing your product, even if you’ve made them promise not to. Your best bet is to focus on your business’ branding and setting your product apart from copycats in any way possible, whether it’s quality, price, options, availability, etc. For guidance on how to build a better brand, check out our blog post A Better Brand: Ecommerce Branding Guide (Step-by-Step). How you make your payment for your first order will depend on the payment terms agreed on by you and your supplier. Whether you’re paying for the whole order upfront, half of the order upfront and half after you’ve received the products, or the entire payment after you’ve received the products, it’s between you and your supplier and both of your preferred payment terms. Payment terms are put in place to prevent both parties from being scammed. You want to safeguard yourself from receiving faulty, unsatisfactory products after you’ve already paid for them and your supplier wants to make sure that they get paid for the products they created. When this is the first transaction between you and your supplier, it’s impossible to know what to expect from one another and there will always be a risk factor involved. Part of the risk factor can be alleviated by the way you transfer money to your supplier. If you pay through PayPal or Alibaba’s Secure Payment Service there are dispute resolution services that can help retrieve part or all of your payment if you get scammed. These options may cost a little bit more upfront than a simple wire transfer might, but it offers more protection and at least you know your money won’t simply be gone. This is why it’s especially important to document all communication between you and your supplier. That’s the evidence you’ll provide the dispute resolution services if you ever get scammed. If you have no documentation you’ll have a much harder time. Other payment methods like Western Union or direct bank transfers aren’t recommended for the simple reason that once you’ve paid your money, there’s little or nothing you can do to get it back. Scams have been known to happen via these payment methods, so you really shouldn’t risk it when there are better options. If a supplier only accepts Western Union or a bank transfer as payment methods, that might be a red flag and you should definitely consider not working with them. It’s better to be safe than sorry. This is not a recommended payment method to use if this is your first time working with a supplier you’ve never worked with before. The supplier will receive the entire payment before production starts so if any issues occur after that point it there is little to no guarantee you’ll get your money back. For the same reasons as paying through a bank transfer, using Western Union as a payment method is risky because the supplier will receive the entire payment before production starts and if there is little to no guarantee you’ll get your money back. This is a complex payment method that is recommended typically for large orders (over $20,000) and only paid to a supplier whom you’re comfortable with and trust. This is a third-party payment system that holds some or all of the money you transfer to a supplier until you receive and are satisfied with your products. 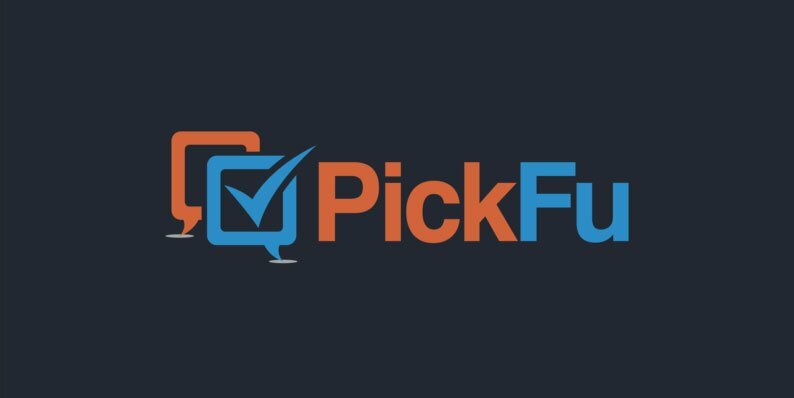 This is a safer payment method to choose because it is possible to recover some or all of your payment back in the event of an issue or scam. This is also a third-party payment system that holds some or all of the money you transfer to a supplier until you receive and are satisfied with your products. This is a safer payment method to choose because it is possible to recover some or all of your payment back in the event of an issue or scam. Your supplier is essentially going to be your business partner. Their work on your products can dictate the success of your business. Always remember that suppliers don’t always need you, you need suppliers. It’s important to build a relationship with your supplier as they’ll be more willing to help you and even make exceptions for you if it comes down to that. Always be clear with what you expect from them, and be realistic. Nobody likes to fail at meeting expectations that weren’t reasonable in the first place, so don’t put them in that position. Reciprocate. If you expect them to be available when you need them, make sure you’re available when they need something from you. If you expect them to respond quickly to your emails, respond quickly to theirs. Be polite and professional at all times and be considerate that they may have different business practices in their country than you do in yours. Be mindful that your supplier may get busy, as they’re also working with other clients and juggling several projects at once, so if you need to send follow up emails but don’t get mad or assume they’re ignoring you. Be upfront. Tell them what your best form of contact is, let them know how you’d prefer to correspond with them and ask what their preferred method of contact is. Let them know when you’re available to be contacted, when you’re not, and any deadlines you need to meet. Shipping products from your Alibaba supplier to your home or warehouse address is one of the most intimidating parts of the process. This is the point of no return: once the products are shipped they’re out of your supplier’s hands and into yours – whether you like it or not. Before your supplier ships your products you should do two things: confirm their responsibilities and get proof. Specify their responsibilities in the invoice you give them. Confirm the agreed price of the products, the cost of shipping the products, the expected delivery time as well as how many products are being shipped. Ask for photos and/or videos of the products, the shipping label and the packaging before they are shipped by your supplier. That probably didn’t ease any anxieties you had about the process, but that’s what this whole process is: just a little risky! As long as you’ve done your due diligence, adhered to your gut feelings and done everything in your power to safeguard yourself then you should only have a little to worry about at this point. So how much work does it take to get your products shipped to let’s say, North America? Supplier conducts the proper paperwork on their end, packs your products into the appropriate boxes, and your goods get prepared to either ship by freight (cheaper option, and sometimes the only option for some products) or air (more expensive option and not an option for dangerous or hazardous goods). Your product exits your supplier’s country via freight or air shipping method. Once your goods reach your country, North America in this example, they need to be claimed (by either you or a customs broker), then they’re loaded off the ship or the plane and inspected by customs. Customs officers consult the paperwork and deem your products fit or unfit to enter the country based on whether or not they meet their standards. This means that they have to have the proper documentation, filled out properly, and they don’t compromise any rules or regulations. Once your goods have been inspected by customs, your freight forwarder (if you’ve hired one-which it is strongly recommended to unless you know exactly how to forward your own freight from customs) will transport your goods to their final destination (your place of business or your shipping warehouse). Then your products will be where they need to be and they can be distributed to your customers. Please note that this is only a rough timeline of the process and that it is different for everyone. Consult the Pacific Customs Brokers website for any questions you may have and make use of their webinars and seminars to learn more about what to expect. Take the time to contact a customs broker to make sure there are no additional licenses, permits, etc. that you’ll need to import your products, and do this prior to paying your supplier so you know of and understand all the costs. Be aware that you should overestimate the amount of time that it’s going to take for your products to be shipped. If you want to launch your products in a month and it’s going to take three weeks to ship, consider pushing back you launch time as it’s very likely it will take longer than three weeks for your products to get to you. Also factor in the time it will take for your products to be cleared through customs and then delivered to you after that. Don’t expect everything to go smoothly. In order to make sure you meet all of the rules and regulations that surround importing your products into your home country, it’s worth the time and resources to hire a customs broker. Customs brokers are individuals or organizations that are licensed by your home country’s border protection agency to help you meet the federal requirements when importing and exporting goods. A customs broker will be the one to prepare and submit all the paperwork that will clear your package through customs. This will ensure that no mistakes made on the paperwork will delay the process, holding up your products at customs while they get resolved. Preferably hire a customs broker that is also an NVOCC (Non-Vessel Owning Common Carrier) which basically means they’re a “freight forwarder” who is responsible to get your goods to their final point of distribution. These individuals are contracted by a shipping carrier, or carriers, and use a variety of methods such as ships, planes, trains and trucks to get goods where you need them to be. They’re logistics experts who can help you get your product to your place of business or your shipping warehouse. Your customs broker should be able to help you out with everything you need to know, but to be on the safe side it’s worth calling your home country’s customs office yourself to find out any necessary information on any duties or tariffs you’ll need to pay, and any delays you might face. Importing: The act of bringing in a good or goods across a nation’s border from an external source, intended for sale. An import for one country is the export of another. Exporting: The act of sending a good or goods from one nation to another nation, intended to be put for sale. An export for one country is the import of another. Customs: An agency with the authority to control the flow of goods in and out of a country with the responsibility to collect tariffs. Duties: A tax charged by a country. Tariffs: A tax to be paid on a particular class of imports or exports. Check the Tariff Schedule to see what importation charges you will have to pay (type your product into the search bar and related results will come up. Use their additional resources to answer any importation and tariff questions you have). Taxes: A financial charge imposed by a country by which failure to pay is punishable by law. As you scroll through your options on Alibaba you may see suppliers advertising how they ship their products using a variety of confusing acronyms. There’s quite a few of them and they all mean slightly different things for you and for suppliers. CFR (Cost and Freight): Requires the supplier to arrange for the goods to be shipped by sea to a port of destination, and provide the buyer with the necessary documents to obtain the goods from the carrier. Through CFR the supplier is not required to have marine insurance against the risk of loss or damage to the goods during transit. CIF (Cost, Insurance and Freight): Requires the supplier to arrange for the goods to be shipped by sea to a port of destination, and provide the buyer with the necessary documents to obtain the goods from the carrier. Unlike CFR, with CIF the supplier is required to have marine insurance against the risk of loss or damage to the goods during transit. CPT (Carriage Paid To): The supplier pays the freight for the carriage of the goods to the named destination. Risk of loss or damage to the goods is transferred from the supplier to the buyer when the goods are in the custody of the carrier. DAF (Delivered at Frontier): Requires the supplier to deliver goods to a named destination (such as a border) by a predetermined time. Up to the destination, the supplier is responsible for the risks and costs associated with the delivery. DDU (Delivered Duty Unpaid): Requires the supplier to make a safe delivery of goods to a named destination, paying all transportation-related expenses but not the duty. The supplier is responsible for the risks and costs associated with the transportation of the goods until they are at the delivery location where the buyer will then be responsible for the duty expenses. DEQ (Delivered Ex Quay): Requires the supplier to deliver the goods to the wharf at the destination port. DEQ may be noted as having duty paid or unpaid. If duty is paid, the supplier is responsible for the duty costs associated with the delivery, if the duty is unpaid then the buyer must pay the costs. Embargo: A government order that restricts commerce or exchange with a specific country. EXW (Ex Works): Requires the supplier to deliver the goods at their own place of business. The buyer is responsible for all other transportation costs or risks. FAS (Free Alongside Ship): Requires the supplier to deliver goods to a named port alongside a vessel designated by the buyer. “Alongside” means that the goods are within reach of a ship’s lifting tackle and “Free” in trade terms means that the supplier is obligated to deliver the goods to a named place for transfer to a carrier. FCA (Free Carrier): Requires the supplier to deliver goods to a named airport, terminal, or another place where the carrier operates. Costs for transportation and risk of loss transfer to the buyer after being delivered to the carrier. “Free” in trade terms means that the supplier is obligated to deliver the goods to a named place for transfer to a carrier. FOB (Free on Board): Requires the seller to deliver on board a vessel designated by the buyer. The supplier fulfills their obligation to deliver when the goods have passed over the ship’s rail. “Free” in trade terms means that the supplier is obligated to deliver the goods to a named place for transfer to a carrier. The carrier ships by sea freight (boat). This method of shipping will take the longest and is usually the least costly. The carrier ships by air cargo (plane). This method of shipping takes less time that sea freight and usually is more expensive. Not all products can be shipped by air (i.e. hazardous materials- including some cosmetic products), so make sure to research the rules and regulations regarding your product. The carrier ships express (fast). This is an ideal method for small quantity orders. It’s up to you to negotiate with your supplier which method (DDU, FOB, FAS, CPT, etc.) you will use to ship the products. Most suppliers will work with shipping carriers such as FedEx, UPS, DHL, TNT, EMS, etc, so expect to ship via one of those carriers. Some carriers also include freight forwarding into the services they offer so take advantage of that so you don’t have to hire a separate freight forwarder. Take photos and videos of the box, the products inside the box, how the products were packed, you testing out the products, etc. Document everything. Inspect your products. Make sure they meet everything you agreed upon with your supplier when you were ordering the samples. Make sure it meets your quality standards, that the color is right, and any other specifications you had. Test out all products, review them thoroughly and check if any products are defective. If there are any defective products, take photo/video proof of them and let your supplier know. It is likely that there might be a couple or a few defective products, depending on how large your order was, but if there’s quite a large number of products that don’t work/aren’t right make sure to let your supplier know ASAP. Most suppliers will happily send you a few products to make up for the defective ones or they’ll add a few more products to your next order, free of charge. It’s up to you to let your supplier know your situation and come to an agreement. Small problems that are easy to solve are likely to be solved by the supplier. No supplier wants to lose a customer over a small problem that’s easy to fix. Large problems, however, are usually met with little to no support as a supplier would rather lose the customer than lose the profit. This is why it’s important to take the steps to safeguard yourself so you don’t find yourself in this position. Find a reliable supplier, order multiple samples, document everything and pay through a payment service that offers dispute resolutions. If things go wrong it’s those steps you took throughout the process that can recover some of your resources and money. This article has hopefully given you insight into the workings of Alibaba and what it’s like to source products from this marketplace. It is often overwhelming with information, acronyms and industry terminology that can make it intimidating to even browse. Once you get more comfortable navigating the interface and know what to look for Alibaba will seem less foreign and a more probable source of inventory for your soon to exist, or already existent business. Always research, conduct your own due diligence and proceed with caution. Know when to walk away, trust your gut feeling and if a deal seems too good to be true it probably is. Use common sense. Pay the extra money for added security. Whether that’s paying through PayPal rather than a cheaper option like a wire transfer, whether you think your supplier sees your vision and you don’t need another sample, whether insurance seems like an unnecessary cost or whether you think you can save money on a customs broker and figure it out yourself seems like a better option, it usually never is. Bite the bullet and spend the extra money for professional services that are experts in their fields that know exactly what to do to save you time, headaches and money. Ask questions and don’t be afraid to ask “dumb” questions. Whether that’s to suppliers, accountants, lawyers, Alibaba forums, Reddit forums, customs brokers, etc, solving any confusion you have is much more valuable than feeling too embarrassed to ask a question. Everyone’s Alibaba experience will be different, but the information in this article should provide you with enough knowledge so you can start sourcing with an informed approach. Good luck! 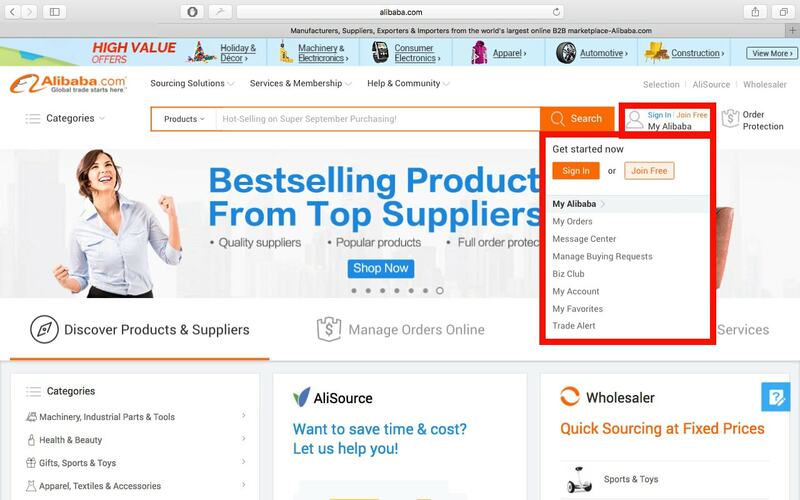 Alibaba New User Guide: Help for new Alibaba users. Alibaba Forum: A place to ask Alibaba related questions. Reddit Entrepreneur Subreddit: Ask your Alibaba related questions or browse previously asked ones. Alibaba Secure Payment Service: A Third Party Payment Service. PayPal: A Third Party Payment Service. Duty Calculator: Figure Out Duties Costs. Pacific Customs Broker & Freight Forwarding (Canada & USA): Hire a Customs Broker & Freight Forwarder or Find Out More Information. Tariff Schedule: Figure Out Tariff Costs for Your Products. ExamineChina: Avoid Scams with Supplier Verification Reports. NextDoor Design & Manufacturing: Sourcing, Product Development & Logistics. Kekai Express: Sourcing, Product Development & Logistics. Think Logistics: Canadian Shipping & Fulfillment Warehouse. Fulfillrite: USA Based Shipping & Fulfillment Warehouse. Shipwire: North America, Europe & Asia Storage & Fulfillment Services. ShipStation: Ecommerce Shipping & Fulfillment Software. Shippo: Shipping API for Ecommerce. Great advice. I’ve been looking into importing from Alibaba recently, so these are great tips that I’ll follow before jumping in head first. What industry are you mostly focused on for your imports if you don’t mind me asking? What type of product are you planning on importing? Or are you still trying to figure that out? I have imported several products. Mostly beauty products. I’m in several niches now with affiliate marketing, and I’m considering jumping into the wholesale-via-Amazon-fulfillment thing. I’m very tempted by the vitamin/supplement industry since the markups are so high (similar to beauty supplies), but the labeling restrictions and liability issues are a concern. I’d definitely do independent lab verification if I went that route. Anyway, it’s great to see advice like yours so freely given. Thanks again! I agree. vitamin/supplements was something I looked at as well but like you, the labelling and liability also scares me. I also heavily considered a tea product from China and Japan but same issue. The article is good, but staarts off as very sophomoric. The Chinese and some of the other up and coming Asian countries behave like Americans did back in the 1920’s when it comes to business. They always want a good deal for themselves and NOT for you! I have a friend who is a professer that goes to China to teach them business ethics of the West. Those who deal in that world know to do business like them and with an eye to deceit. It has nothing to do with race, but everything to do with surving in the business world. The many that act in this way believe it means they are smarter than you and better. This applies to many, but definitely not all businessmen in this area of the world. You’ll find deceit wherever you go. In this part of the world, please remember they have yet to develope the practice of business ethics; relying more on traditional practices. They are learning just as we are (How are grandfathers and great grandfathers behaved). Great read, but it seems like it ends too early… What happens after you choose a supplier? I’d love to read some stuff on actually shipping the items to NA. I felt the article was beginning to get a little long and figured I would write a part 2. Hopefully I will be getting that done in the next month. Check back soon or subscribe to my blog to make sure you get that one. Hi Richard. Like Telic I am also interested in the shipping portion of process. Did you ever get around to writting a follow-up article? With all of the acronyms floating around such as EXW, FCA FAS, FOB, CFR, CIF, CPT, etc., it’s very confusing. Most Chinese manufacturers list FOB (Free on board) as the shipping method, but how much work is involved in getting the product to my door? But from my point of view – the prices are higher then on aliexpress or dealextreme. Of course it’s not right to simply compare those marketplaces, but 50% of ebay sellers sell the same things as on aliexpress. Or they just drop ship. Thank you so much for your posts! I have found your website this morning, and there’s so many fantastic information for beginners like me: THANK YOU SOOO MUCH! 2) I have this product idea, when contacting manufacturers in websites like Alibaba.com can I show them my prototype and some will accept to try it? or alibaba is really only about the products in the website? 1) what about intelectual property? how can I be sure that when contacting X amount of manufacturers they will not steal my idea? is there anyway/website to make sure that the idea is not stolen? It has loads of awesome prodcuts that you can buy for cheap and sell for more! please check out the site and let me know what you think, i’d love any feedback. Hey, what about import/export, taxes, customs, etc. when sourcing something from alibaba? I’m in the US and looking at potentially ordering a product to be shipped from China. Is there somewhere I could find resources about this final part of the process?